is a colored skin markings of slate-brown or blue/grey coloring. It is an unusual birthmark in which the melanocytes (pigment cells) are found deeper than normal (in the dermis instead of the epidermis). 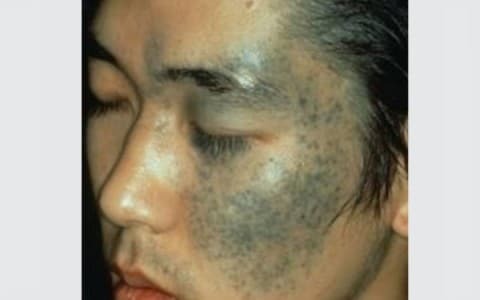 This is also known as dermal melanocytosis. By using Medlite C6 Laser, this type of pigmented birth marks could be affected deep in dermis and the patients may see improvement in just a few sessions. Laser for Nevus of Ota: It is considered as one of the powerful and effective lasers . Histologic findings for nevi of Ota and Ito are similar. Overlying epidermis is normal. In the papillary and upper reticular dermis, dendritic melanocytes are present and surrounded by fibrous sheaths (which are not present in other dermal melanocytosis, such as blue nevus or Mongolian spots). Dermal melanophages may be present. Nevi of Ota have been classified histologically into 5 types based on the locations of the dermal melanocytes, which are (1) superficial, (2) superficial dominant, (3) diffuse, (4) deep dominant, and (5) deep. This histologic classification correlates clinically with the observation that the more superficial lesions tend to be located on the cheeks, while deeper lesions occur on periorbital areas, the temple, and forehead.